A traditional tribute that communicates deep love and eternal commitment. 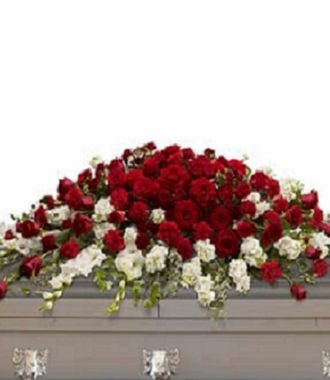 This dramatic red and white casket spray is ideal for a full couch or closed casket, mixing dozens of deep red roses with the pure white beauty of gladioli and stock. Red roses, spray roses and carnations along with graceful white gladioli and stock are arranged beautifully with ivy and salal.